3D printing seems to be constant experimenting. With the success of the multi-part rings, I have more confidence in splitting a design into pieces. 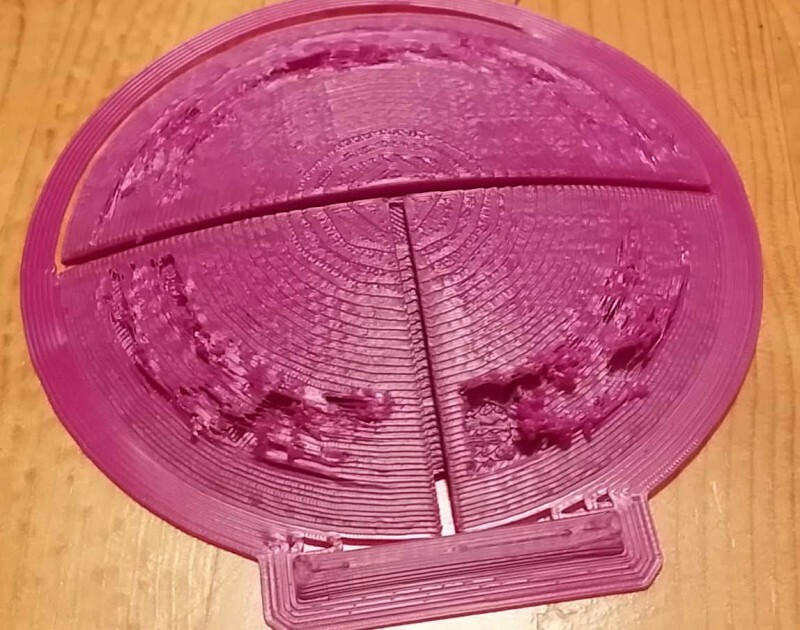 Less chance of running out of filament just before the end of a plot. If a large plot warps it may need to be replotted – pieces take less time to replotted. Printing larger than the 8x8x7 theoretical maximum is possible. More work to join or glue pieces together. Warm up and set up time multiplied by the number of pieces. Need to allow for wall thickness being increased by extruded filament thickness. (If not allowed for the parts will be larger than expected. and be even more difficult to join together). Adding the pros and cons up it seems that I the main con is time to join pieces and the extra work to join pieces. This is yet another experiment – not sure how it will work, and I will understand more about the process when I’m done. One of the first pieces I attempted to print was the tip of the dome. Next I should have read my horoscope.